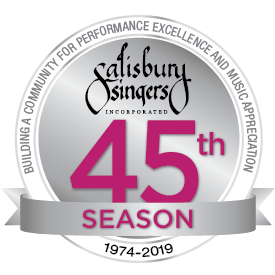 Salisbury Singers is auditioning for all parts. To arrange an audition, contact Michelle Graveline, Artistic Director, at mgraveli@assumption.edu. Shop with AmazonSmile and Choose Salisbury Singers. Amazon will donate 0.5% of your purchase price to Salisbury Singers. Donate Directly and Securely. Thank you for your continued support. 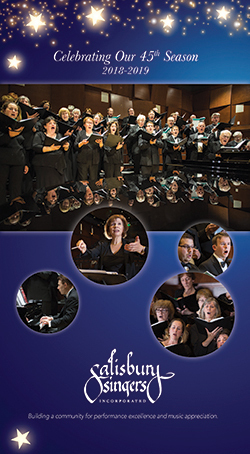 An ad in our programs will reach hundreds of concert goers and support Salisbury Singers. Click here for information on advertising, including prices, sizes available and specifications. Want a sneak peak at the program for this performance? Click here. 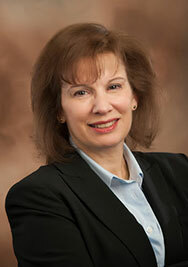 Michelle Graveline is active as a collegiate and community chorus conductor, teacher, adjudicator and clinician. She is Professor of Music at Assumption College in Worcester and is past President of the Massachusetts Chapter of the American Choral Directors Association. Learn more. Our 45th season offers some exciting performances beginning with the Worcester premiere of Dan Forrest’s new work, Lux: The Dawn From On High. Click here to open or download our new brochure. Purchase The American Spiritual Tradition ($15), a professionally produced recording of the chorus’ beautiful sound as they sing this beloved music, online here.